Each class will have a 5 minute assembly at 9.05 each morning. Pupils are expected to be in school at five minutes before assembly. Pupils are not free to leave the school grounds without authorised permission during the school day. The school day is from 9.05 a.m. until 3.57 p.m.
All letters from parents requesting permission for leave of absence from school should be left in the box provided at the secretary’s office before class begins in the morning. When a pupil is absent for any reason he/she must present an ‘absence note’ to his/her Year Head. This should be signed by the parent/guardian and should outline the reason for the absence. Pupils are not allowed to make ‘phone calls or receive ‘phone calls during school hours without special permission. The school will not accept responsibility for students who leave the school without permission during regular school hours. Students who do not miss a day of school are rewarded with a certificate of attendance at their class awards ceremony. 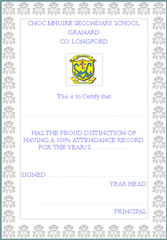 Leaving Certificates who have not missed a day of school during their entire stay recieve the valued ‘Full Attendance’ Certificate at their graduation mass in May.